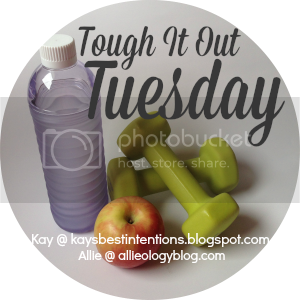 It’s another Tough It Out Tuesday! Let’s see, how is spring break and fitness factoring together? Fitness is getting some attention, healthy eating not as much. Apparently I eat better when I’m working because I plan better. I’ve got to get that under control before summer break happens! Anyways, the fitness has been going well. Yesterday, I took my furbaby for a nice walk to enjoy the weather. Today was super rainy though, so I did some shopping (yay for easy walking!) and an indoor Wii Workout. My favorite Wii Workout game is the Gold’s Gym Cardio game. You get your own trainer who leads you through various boxing workouts. I always work up a sweat when doing these! Visit my instagram to see another shot from the game! A sweaty selfie to prove I didn’t just stare at a screen!